Enjoy this cooling spritzer when the temperatures heat up and the sun is shining! 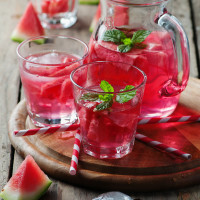 Instead of sugary juices, which spike your blood sugar, the electrolytes found naturally in watermelon will restore your energy while the mint perks you up. This beverage is a good choice for those of you following the Basic Plan in my book, The Blood Sugar Solution. Place the watermelon and the mint in a blender and blend on high until uniformly combined, about 30 to 60 seconds. Add the lime juice and stir to incorporate. Best enjoyed when fresh, but you can store the melon mixture in a tightly sealed container in the refrigerator for up to 3 days; when ready to use, simply add sparkling water and enjoy.